The Decatur Arts Alliance, a 501 (c) 3 organization supporting the arts and arts education in Decatur, GA, invites you to apply for booth space in the Decatur Arts Festival 2017. The 28th annual festival will be held on the square in historic Decatur, GA, just minutes from downtown Atlanta. The Artists’ Market will be open on Memorial Day weekend, Saturday, May 28 from 10am until 6pm, and on Sunday May 29 from 11am until 5pm. The festival features continuous entertainment and performing arts in the Community Bandstand adjacent to the Artists’ Market. Food vendors, a Fine Arts Exhibition, the ArtWalk, Literary Arts, New Dance, and a Children’s Festival are also part of the festival activities. Decatur Arts Festival 2017 prizes for Best of Show, Second, and Third Place will be awarded. The Best of Show winner will receive an invitation to the 2018 show free of charge. Second and Third Place will receive invitation to the 2018 show at half price. Cash prize for Best of Show is $1000, Second Place is $700, and Third Place is $500. 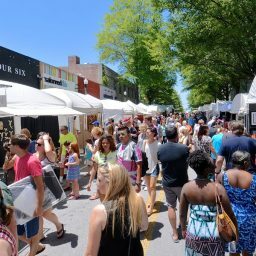 The annual market is known for its high quality of artwork and attracts artists from all over the Southeast and beyond. More than a dozen media categories are represented by new artists and festival favorites. This festival draws 70,000 attendees including art critics from the Atlanta area. The Decatur Arts Alliance (DAA) is a nonprofit partnership of artists, business owners, residents, and government dedicated to supporting and enhancing the arts in the city of Decatur. The DAA sponsors the annual festivals as well as special art events for members only. It provides a collaborative environment to coordinate the interests of artists, gallery owners, theater groups, dance groups, and performance venues within Decatur and to develop the city as a strong arts community. DAA sponsors the Decatur Arts Festival, the YEA! event for young emerging artists, Oakhurst Porchfest, the Decatur Artway, the Book As Art Exhibition, and the Decatur Wine Festival.